Grantchester (1935), Gwen Raverat © Raverat Ltd & Elisabeth Hambro. An exhibition at Kettle’s Yard showcases the wood engravings of Gwen Raverat, one of the first modern British wood engravers, who played an important part in that technique’s revival in the first half of the 20th century. A granddaughter of Charles Darwin, Raverat grew up in Cambridge before studying at the Slade School of Art, where her style was influenced by the work of the post-Impressionists. Working independently of other schools of British engraving, she developed an original style, focusing on scenes of rural life reproduced in a painterly manner. Wood Nymph © Raverat Ltd & Elisabeth Hambro. Raverat spent most of her life in Cambridge, and made it the subject of many of her works, including her popular memoir Period Piece – a Cambridge Childhood (1952). This link has now been commemorated with an exhibition in the Ede’s house at Kettle’s Yard, curated by Andrew Nairne and Laura Pryke with the assistance of the Raverat Archive and the Fitzwilliam Museum. Displayed in Helen Ede’s minimalist former bedroom, the woodcuts are mainly devoted to pastoral scenes of life in Cambridge during the 1920s and ’30s. They all communicate a tremendous feeling of peace, evoking the languorous rhythms of small town life, and Raverat’s distinctive use of dark shading produces an unhurried, muted effect. Apart from a group of men enjoying a game of bowls, the subjects of the prints are mostly landscapes, populated by nothing more active than a herd of cows, or a drift of swans, whose rippling progress under a bridge seems almost frantic in comparison to the other prints. Raverat’s depiction of water is masterful, managing to evoke fluidity even when working with so immobile a medium as wood. The display also demonstrates the strength and precision of her wood engraving. A dense network of extremely fine, exactingly carved lines are used to trace out the complicated shapes of the plants and foliage seen in many of the woodcuts, such as Poplars in France, perhaps the most technically accomplished of the prints. 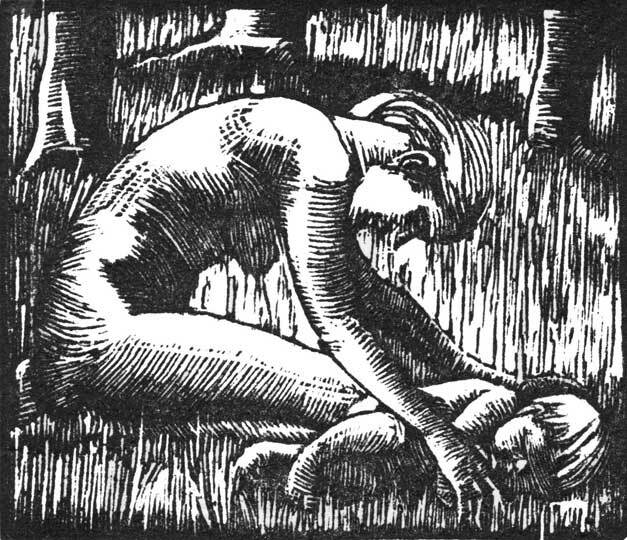 Sleepers (1927), Gwen Raverat © Raverat Ltd & Elisabeth Hambro. This is particularly evident in a small group of figure studies in a cabinet by the door, which also contains one of Raverat’s sketchbooks and a selection of her wood-engraving tools. Two of the prints – Wood Nymphs (1910), and Sleepers (1927) – depict the Raverats’ nanny, Babette Giroux, clad in flowing drapery reminiscent of a classical statue, each fold reproduced in high detail. The prints are nicely complemented by their pale surroundings, and the exhibition also provides a welcome opportunity to visit the rest of the house. It’s an interesting modernist space filled with a delightful mixture of paintings, prints and china collected by Jim and Helen Ede, including a portrait of Gwen Raverat drawn in pencil by Elisabeth Vellacott. Gwen Raverat’s wood engravings are on show at Kettle’s Yard, Cambridge, until 23 November.